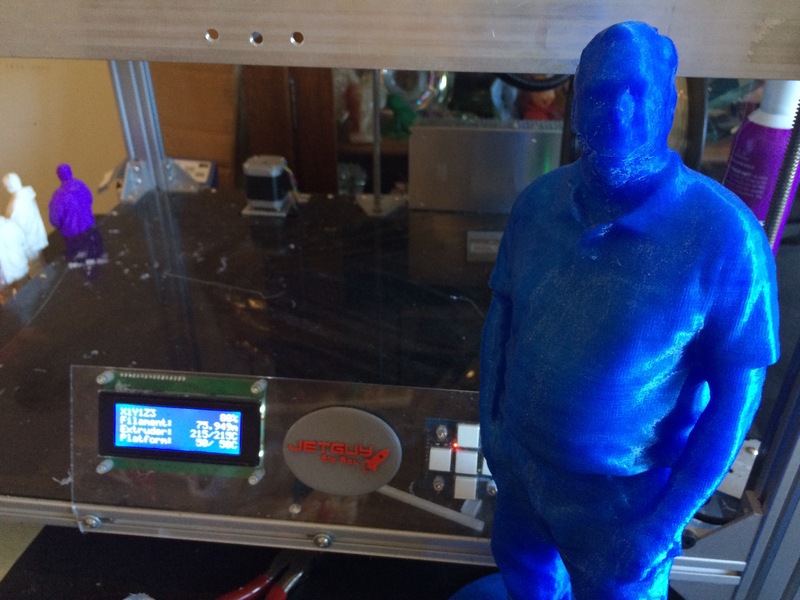 Maker Profile: The Maestro of 3D Printer Building– Jetguy! I spent the week driving to and from South Carolina, making a pilgrimage to the Mecca of 3D Printing; the home of Vernon “Jetguy” Barry. I first met Jetguy at NY Makerfaire almost 3 years ago, where he was showing off a massive 3D printer he had built, his Ulti-Replicator with over a meter square build area. I scanned him at my first ever NY Makerfaire appearance of the Scan-A-Rama 3D Portrait Studio, and we instantly became friends. Last year when he saw some of the work I’d been doing on Luna Park he dropped hints that we would be willing to build me a custom machine. So when I got this year’s Creative Glass Center of America Fellowship at Wheaton Arts I finally contacted him about building me a machine. My only design constraints were that it needed to be able to print at least a 12″ cube and it had to be less that 24″ wide so I can fit it down my basement stairs. When 3D printer folks talk about Jetguy, its not uncommon to hear descriptors like Jedi, Ninja, Mad Scientist or Genius. He is a master engineer who understands all the mechanics of 3D printers in a way that few others do. For those who don’t know, these machines are complex organisms that take a knowledge of mechanical engineering, electronics, physics and how these elements interact with the firmware software they run on. Jetguy doesn’t have a huge online presence, except in online forums like the 3D Printer Tips and Tricks Google Group, where he can always be found weighing in about his passion, 3D printer hardware design. To hear this guy talk is inspiring because his passion is about hardware design and he’s among the best 3D printer builders I’ve ever met. He also isn’t even interested in selling machines, he just loves tinkering and iterating on his designs. Arriving at Jetguy’s nondescript house in an unassuming cul de sac in a Charleston, SC suburb was like discovering the secret batcave location. As I entered, it was evident that he is a confirmed bachelor- 3D printers in various states of completion and dissection were everywhere. 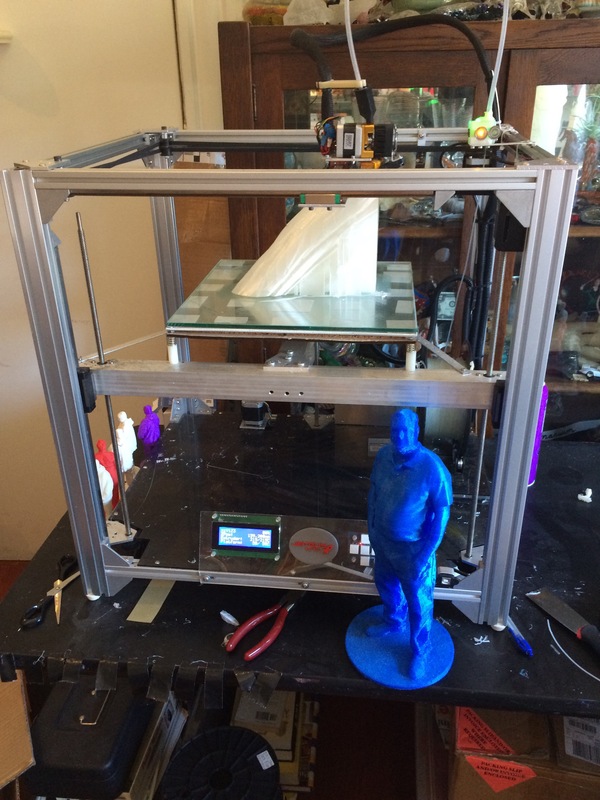 His foyer, living room, garages and kitchen counters were like a museum of 3D Printing. After the tour which included firing up a chinese tractor engine with a crank (It was raining so no jetcart rides today), it was finally time to get to the main event- the unveiling of the new printer. The machine marks the culmination of all of Jetguy’s learnings from previous machines like the CoreXY Ulti-Replicator, which combines all the best elements of the Makerbot Replicator and the Ultimaker designs with Dan Newman and Jetty’s open source Sailfish firmware. Jetguy explained to me that CoreXY is an open source 3D Printer design in which the belts governing the X and Y movement are set up so they cross in an X, and pull at opposite corners of the XY gantry to reinforce the movement of the extruder. To the non technical, its a fully open source hardware/software design that generates highly accurate prints. The almost 14″ cubic build area of this latest machine was built with off the shelf parts sold through Adafruit and Amazon and he plans to release the bill of materials in conjunction with his build log on Flickr. Jetguy was beaming as he unveiled the Fredini CoreXY! The personalized LCD was a joy to see! An “A” belt pattern driving the Z screws ensures maximum surface area of the belt on the gears. Core XY belt pattern- this enhances the machine’s rigidity as the gantry moves in X and Y directions. Astrosyn dampers on the motors make this the quietest 3D printer I have ever heard. The power source doesn’t have a fan so literally the cooling fan on the extruder is all you can hear while its printing! We christened the machine the Jetguy “Big Boy” and I designed a Jetguy logo which we printed in two colors to mount on the front of the machine. Jetguy’s Type A design, which he has provided to numerous local schools- one school reportedly has run more than 100 miles of filament through theirs! He’s also a huge fan of 3D System’s new Cube printer hardware design. He reapaired my beta unit that never worked properly and is anxious to work with them on resolving their firmware and slicer so the machine can realize its potential. So, a huge thank you to Jetguy for all his generosity. I’m finally home and the Big Boy is hard at work churning out the first of many parts for me… a 33 hour print. My son will be surprised to see the machine set up in his bedroom when he comes home. Stay tuned to see some progress on my Gates of Heaven, to be cast in glass at Wheaton Arts this summer! Won’t Kostya be surprised to find this on his desk when he comes home for the summer?